AquaStik is our go to epoxy for its low cost, and excellent performance. The Two Little Fishies epoxy putty is easy to mix, and the coralline purple is one of the closest color matches on the market. Epoxy putty is widely used around the aquarium hobby because it is non-toxic and easy to use. The color of the putty allows it to blend in with its surroundings making it easier to hide than other types of adhesives used in aquariums. 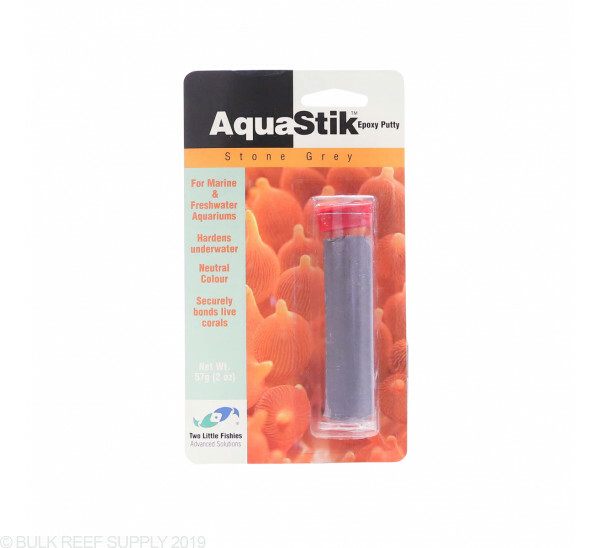 It is recommended to use a minimal amount since most corals will grow over the adhesive in a matter of weeks. We suggest using and mixing small amounts at a time due to the quick setting nature of epoxy putties. On average you will have about 5 to 15 minutes of working time once mixing is completed. The epoxy cures in dry air, damp conditions, or even underwater. 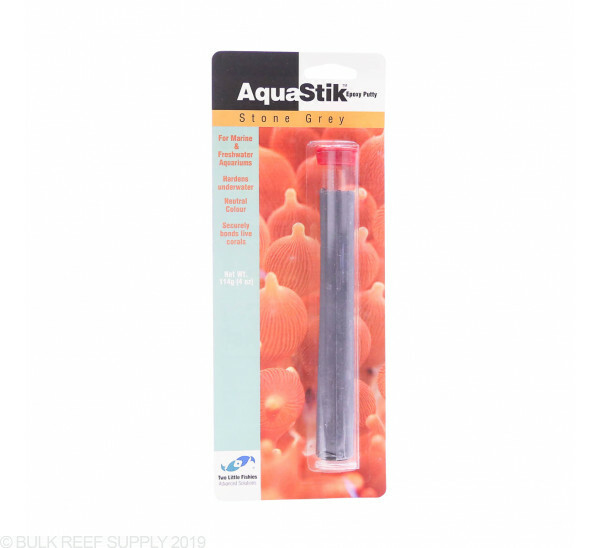 Stone Grey - Great for new tank builds with fresh dry rock or new frag plugs. I ordered this product to attach different peices of tonga branch rock together after my first attempt with water weld failed. To ease this process I used super glue on one connection point and sprayed Instaset on the other. After after waiting 30 seconds i went to the next joint. After every connection was secure with super glue i began to knead the epoxy. About an inch per large section, 1/2 inch for smaller connections. The super glue connections allowed me to leave and set without worry of ths initial low hold power of the epoxy. The super glue used was BRS brand. I was impressed. I have tired other products and they did not work well underwater. This stuff does! 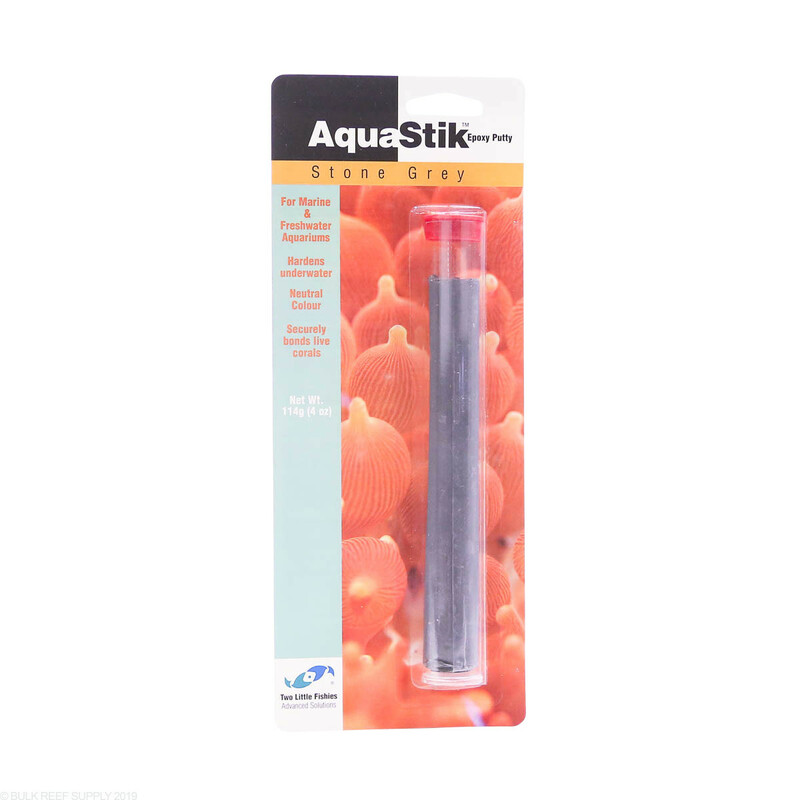 Used this when aquascaping Tonga branches, did half the project well and the other half, well I had to redo it in my tank a few weeks later because it failed...maybe user error I don't know. But I would recommend it as I have used it several times before! I used 4 oz. of this to put together an otherwise impossible structure with about 30 lbs of Reef Saver Rock. This putty holds like cement, but you need to make sure you clean off all the dust on your rock first, and really make sure you hold the rocks together tightly for 5 minutes to set a strong bond. I have no idea how well this would secure rock that is live or wet, but for those looking to aquascape dry or outside of your tank, this stuff allows many rocks to become one amazing looking reef structure. this is my go to item when i need to secure floral to rocks. great color and consistency along with the price!!! Get more product for the price compared to the ocean wonders. Color doesn't make any difference to me. I use this in conjuction with super glue gel. Use this to form around the area. Once hardened follow up with super glue gel now that it has lots of surface area to crab. I don't run a skimmer so non-issue for me but it does cause to overflow. If you have a air valve reduce the air on your skimmer. Will be back to normal after 24-48hours. Makes protein skimmer go nuts and does not hold together heavy rocks. Super Glue would work in combination with this better. Working time is just as advertised... not very long. This can be very good for mounting corals as one doesn't have to hold those corals in place for such a long time. I use this in combination with BRS super glue gel to really get a good hold. I like that the color makes it much less conspicuous than other putty. I used gloves as I didn't want to get this stuff all over my fingers. Again, works very well and the price is pretty ok. I went through almost the whole tube in one go and only had a little extra action on my skimmer. I didn't bother to adjust it. Wasn't a big deal. Used this in the tank to secure corals. Used it out of the tank on dry rock to create aquascape. Also used this in wet rock taken out of the tank. It dried quickly and the red blends nicely. I would repurchase.